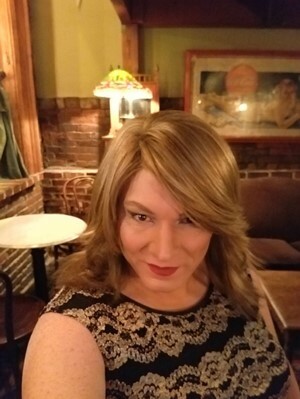 It is Wednesday and our group is having dinner at Oldtown pizza downtown, we have gone here many times before as a group but I think this is only my 3rd time. Melissa and I decided this on Saturday and she posted it in the group so I am hoping it will be a good turnout as we have had several girls post they would be here tonight. Now it has been a long day so I was hoping to go early just to get a little more Susan time. I started getting ready a little after 4. I really enjoy this part as there is just something about the time, I take becoming Susan. I was ready and on my way about 5:45. There was a little more traffic tonight so it was almost 6:30 when I got downtown but that was still early as we were not meeting till 7. I lucked out and found a parking sport right in front and went in. I sat down at the bar and ordered a drink. also booked her room so we have 3 for sure going, yes I am counting myself. Melissa showed up just before 7 and shortly after her Kris, Barb, Lauri, Kitty and Kimberly showed up so we had 9 of us here tonight. Tonight, was one of our bigger turnouts in a long time, it really was great to see so many out. We all talked for a while then we went up and ordered food, Cassandra paid for it and we all chipped in money. We had some of their cheese bread which is incredible, could have made a dinner out of that and then of course we had pizza. They really do have really good pizza here. Now I did get a selfie tonight. Our pizza came and we had a nice dinner as we all sat and talked, I ate to much pizza tonight but it was so good. Now even after dinner we sat and talked for a while and about important things like nails, well we also talked about Diva Las Vegas, our group and dinners, and the cruise our group did. Actually, we are talking about doing an Alaskan cruise which would be fun as I have always wanted to go to Alaska. Now they are talking this fall which I may not be able to make so I am hoping we can do it next year. It was such a wonderful night and it was about 9:45 when we called it a night, yes, I stayed out later than I planned and although tomorrow I will be tired it was so worth it. We really do have an awesome group and I have wonderful friends. Thanks for reading and be sure and see what is new on my most recent blog. Diva Las Vegas is March 31 to April 5th and I have my vacation set. Cassandra and I are going to Diva Las Vegas, we have Reservations at the Four Queens downtown Las Vegas. Still time to sign up if you are interested. Check out the Diva Las Vegas web page at http://divalas.vegas/ and if you want to stay where Cassandra and I are staying check out the Four Queens http://www.fourqueens.com/ we have gone for several years and it is so much fun. Susan – thanks for being such a great blogger. It’s always fun to read your posts. I look forward very much to meeting you in person soon. If something gets planned for this Wednesday, I will be there!